Executive Summary: This is the second in a new series of articles to look at the performance of a larger array of corn marketing strategies by updating an earlier study covering 1979/80-1983/84. Focus of this article is on two strategies based on cost of production which both performed marginally better for the 2008/09-2012/13 period than for the earlier period, but exposed the hidden flaws in the strategies. In a nutshell, the cost based strategies force the producer to choose between covering cost of production and reducing revenue, or maximizing revenue and failing to cover cost of production. The cost of production approach may provide price risk protection but is not robust enough to take advantage of significant market rallies to maximize revenue over time. The heart of the problem when using cost of production as a basis for marketing decisions is the near total disconnect between the cost for an individual unit and what the market is willing to offer for that production. This is a classic case of trying to make the market conform to your plan rather than planning to conform to the market. This is the second in a new series of articles to partially update a study and report for the Illinois Corn Marketing Board in 1985 titled “Evaluation of Corn Marketing Strategies for Harvest Delivery of Corn at Selected Illinois Locations: 1979/80-1983/84.” If you have not read the first article which describes the update process, please do so now. While doing that, I encourage you to print copies of the two tables that were included in the article. The first article in the series focused on two strategies based on seasonal prices. This article will concentrate on two strategies which both use cost of production as the trigger to initiate sales. The difference between the two strategies based on cost of production is that one strategy is designed for one sale per year when cost is covered while the other strategy is designed to make incremental sales by starting at the estimated base cost of production and scaling up sales as the price rallies. Strategy 12 is a traditional strategy based on cost of production that has been around for decades. It is still widely taught on campuses and advocated by many marketing advisors. The strategy assumes that the producer calculates cost of production and sells the grain at the first opportunity to cover cost and desired profit. Because different producers value their capital assets in different ways, and have a range of expectations for returns on those assets, cost of production is not standard across all farms. Five cost levels were used to evaluate the impact of this strategy in the 1979-83 study. The levels that were chosen were from $2.00 to $4.00 per bushel in increments of $0.50, with $3.00 being close to the median across many farms when standard accounting practices were applied which valued assets near their market value. This strategy integrates a simplified marketing plan into the basic farm management plan and has logical appeal. Making sales to transfer price risk when cost of production is covered is a sound management practice. The plan appears to be easy to understand and is relatively easy to implement, but often falls short when evaluated against some standard of performance. The strategy has three major flaws that can produce unexpected results, as you will see in the results from the studies. The first flaw is that if taken literally, you are left with no marketing plan if the price is below cost of production. Perhaps it is even more important to have price protection when you are below cost of production and in danger of prices falling even lower than when price is above cost of production. The second flaw is that the strategy does not provide for taking advantage of major rallies which carry the price well above cost of production so that revenue can be maximized. 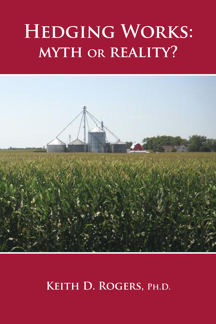 The third flaw is that most farmers can get a reasonable estimate of cost per acre early in the production cycle, but find it is impossible to accurately estimate cost of production per bushel or revenue per acre without knowing the actual yield. Thus, use of this strategy means that the pricing decision rests on estimates which may be off substantially when the grain is in the bin and final yields are calculated. Knowing these potential flaws exist, let’s see if any of them are manifested in 1979-83 study. As a reminder, the base strategy in the 79-83 study generated an average cash price of $2.73. Using the $2.00 cost level as a trigger for sales, the average price generated was $2.57, or a discount of $0.16 per bushel under the base strategy price. Using a cost of $2.50 generated a discount of $0.01 and an average price of $2.72. Using costs of $3.00 and $3.50 generated premiums of $0.02 and $0.19 and average prices of $2.75 and $2.92. Using $4.00 as the cost trigger resulted in no sales in any of the five years, so the average price is shown as $2.73 with no premium or discount. In summary, the strategy produced a premium for two cost levels, a discount for two cost levels, and no sales for the $4.00 cost level. At the two lower cost levels ($2.00 and $2.50), the strategy covered cost of production but produced discounts which resulted in average prices that were lower than if no action had been taken. The marketing plan at these two levels could be judged successful because cost of production was covered, but comes up short as a management plan because at least one better alternative was available. At the next two cost levels ($3.00 and $3.50), the strategy produced a premium over the base price of $2.73 resulting in prices of $2.75 and $2.92 that failed to cover cost of production. Obviously, using these two price levels to initiate pricing decisions was better than using the two lower cost levels, but was totally inadequate if these really are the actual cost of production levels. At the $4.00 cost level, the entire strategy falls apart when no sales are initiated because the price is below cost of production. There is no price risk management, and failing to generate a price that will cover cost of production in any year has dire implications for the business unit. Strategy 15 for the 79-83 study is very similar to Strategy 12 except that sales are started at the cost of production with a plan to scale up in four $0.25 increments. The design is the same as Strategy 12, so this strategy has most of the same flaws which were discussed above. The scaling up component does provide a potential to capture some of the benefits of price rallies. Using the $2.00 cost level as a trigger for sales, the average price generated was $2.63, or a discount of $0.10 which was slightly better than the $0.16 discount with the previous strategy. At the $2.50 cost level, a small premiums of $0.04 was generated which resulted in a price of $2.77 which covered the cost of production. At the $3.00 and $3.50 cost levels, small premiums of $0.07 and $0.04 were generated but the resulting prices of $2.79 and $2.76 failed to cover the cost of production. As with Strategy 12, the cost level of $4.00 was too high to trigger sales in any year, and would have dire consequences for the unit in the long run. In summary, the two cost of production strategies had essentially mirror image results. The low cost level did trigger sales that covered production costs, but triggered the sales at low price levels that were below the base strategy. In effect, protection was purchased against price risks that did not exist. The only strategy that worked was the medium low cost of $2.50 which triggered sales that resulted in a premium or very small discount compared to the base price and covered the cost of production. The medium and medium high price levels of $3.00 and $3.50 were effective at producing small premiums, but not sufficient to cover cost of production. At the high cost level, the strategy failed completely by being totally ineffective at triggering any sales. It produced the same results as if there had been no price risk strategy at all. Rolling forward 25 years and many structural changes later, we find very little difference in the performance of the two strategies. As mentioned earlier, the number of cost levels was reduced from five to three in the 2008-12 study. Because of the general redundancy in the way the cost of production affected the average sales price in the earlier study, only three cost levels are presented in the 2008-2012 study. Estimated costs have now moved up into the $4.50 to $5.50 per bushel range, and the trigger price has to also include allowance for basis because the quoted prices are futures prices rather than cash prices. The medium trigger level for the 2008-2012 study was set at $5.50 to cover cost, profit, and basis. The high and low cost values were set $6.50 and $4.50. At the low cost level of $4.50 (cost, profit, and basis), Strategy 12 resulted in a price of $4.91 which was a $0.38 discount under the base strategy price of $5.29. However, the picture is not quite as clear as before. Two of the five years produced premiums in excess of $0.65 per bushel, while three years produced discounts in excess of $0.75. The strategy gets good marks for covering the cost of production in all five years, but poor marks for consistency and maximizing revenue. At the middle level of $5.50, Strategy 12 produced a small discount of $0.08 and did not cover the cost with a resulting price of $5.21. The performance is really a mixed bag. Cost was covered in four of the five years, but the fifth year resulted in a price of $3.91 which missed covering cost by $1.59 per bushel ($5.50-$3.91). At the high cost level of $6.50, sales were triggered in four of the five years. Two years produced premiums and two years produced discounts. The average price of $5.78 was higher than the base price and higher than the results with either of the two lower cost levels, but more than $0.70 per bushel below the cost of production. As we move to Strategy 15 and the scaling up version of the cost strategies in the 2008-12 study, the results are very similar to Strategy 12. At the lower level, an average discount of $0.28 resulted in an average price of $5.01. The strategy gets high marks for covering cost of production, but poor marks for maximizing revenue. In fact, the average again suggests that the strategy is addressing a price risk which is more of a myth than reality for this cost level. The middle price level with scaling up does squeeze out good marks for both covering cost and maximizing revenue. The premium of $0.22 was sufficient to produce an average price of $5.51 that just covered cost of production. The results for the high cost level are a mixed bag again. The strategy did produce an average premium of $0.83 which resulted in an average price of $6.12, but falls short of covering cost of production. It also should be noted that $0.65 of the $0.83 premium average was generated in one year. To summarize the results from the 2008-12 update, the low cost level resulted in prices that covered cost of production, but were lower than the base strategy with no price risk management. The high cost level resulted in prices that were a premium over the base strategy but did not come close to covering the cost of production. At the middle cost level, Strategy 12 did not cover cost, but Strategy 15 did. Looking at the results from the original study and the update together, there are several points to be noted. 1) There was very little difference between the original study and the update in the overall performance of the two cost based strategies. 2) Using a low cost of production to trigger sales has been effective at locking in prices to cover those costs, but has consistently produced less revenue than a “no action” strategy. 3) Mid level cost triggers tend to produce small premiums over the “no action” strategy, but struggle to cover the costs. 4) High cost levels often prevent any sales and rarely produce prices sufficient to cover the actual costs. 5) Starting with a base cost and scaling up does improve the results, but does not change the overall performance. 6) The cost of production approach may provide price risk protection but is not robust enough to take advantage of significant market rallies, and fails to maximize revenue over time. Posted by Keith D. Rogers on 4 October 2013.